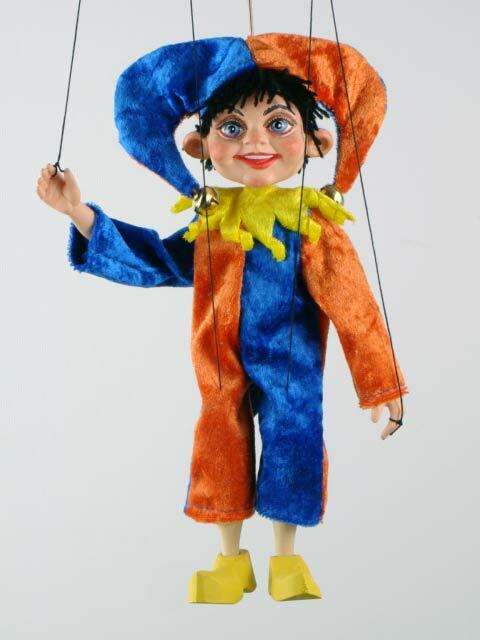 Buffoon puppet marionette for sale. The classical skeleton of the puppet and its legs and footwear are made of wood. The puppet's head and arms are made of special shockproof elastic material. The puppet’s clothes are made by hand of natural materials: flax, cotton or leather. The doll is controlled with the help of a cruciform rocker, metal wire and threads. The control system ensures great freedom of the doll’s movements. The marionette may be used as an original gift, a children’s toy, as well as for performances in a home theater. A beautiful and original gift, Czech souvenir made by hand!